Cheesecake is one of those desserts which can be either a bit time consuming and tricky or super easy, no faff, throw it together and forget about. My Easy No Bake Stem Ginger Cheesecake (as the name suggests) qualifies as the latter and is simply perfect when make ahead, easy and delicious dessert is being called for. Don’t get me wrong I simply adore cheesecakes and really don’t mind putting a bit of effort in making them. My two all time favourites being this Baked Lemon Curd Cheesecake and Chocolate Marble Cheesecake. However, it’s always good to have something effortless yet delicious in one’s cheesecake repertoire, don’t you think? My stem ginger cheesecake definitely fits the bill! This cheesecake is all about ginger and its spicy warmth which can be tasted in lovely crunchy ginger biscuit base and little pieces of fragrant stem ginger suspended in cheesecake mixture itself. The spiciness is beautifully contradicted by the creaminess and subtle sweetness of the cheesecake. I made this cheesecake around the same time as my Easy Homemade Plum & Chocolate Spread which has since turned out to be my and hubbie’s favourite accompaniment to lots of things, including this very dessert. Both flavours marry together in delicious harmony – stem ginger and plums plus chocolate equals heaven! Alternatively, simple plum conserve or even a drizzle of some stem ginger syrup will work here beautifully. The most difficult part of making this scrummy dessert is waiting for it to chill so that it’s firm enough to serve but I can assure you, it will be well worth it! If you are a fan of easy desserts and ginger than this Easy Pear and Fresh Ginger Cake is worth a look. It’s out of this world delicious and takes minimum time and effort to make! Creamy and not overly sweet cheesecake, with warming spiciness from stem ginger and ginger biscuit base. Delicious make ahead dessert, perfect for entertaining! Put the mixture into cake tin and press as evenly as possible to the base of the tin. Put the tin in a fridge for the base to firm up until you're ready with your filling. Whisk double cream using hand held mixer or standing mixer with whisk attachment until it starts to thicken (be careful not to overmix as it will turn into butter). Add sugar and whisk it a bit more. Add cream cheese and gently beat it in with a whisk or simply folding it in using silicone spatula until well combined. Add chopped stem ginger and syrup and fold them in gently. Pour the mixture on top of the biscuit base, smooth out the top and refrigerate until well chilled and firm min 4 hrs. Serve with some more stem ginger and drizzle of the syrup and enjoy! Feel free to adjust the amount of stem ginger as per your liking. 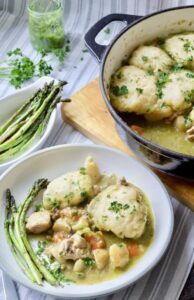 I found the amount in this recipe perfect for our palates. Remember that you can always mix in more but you cannot take away so proceed with caution. Pin Easy No Bake Stem Ginger Cheesecake for later! Baking Crumbs hosted this month by lovely Angela of Only Crumbs Remain. It’s her farewell post so do check it out! This looks super delicious, I’ve pinned it. There is a jar of ginger syrup in my pantry and candied ginger is a favorite. Thanks for bringing it to FF. Aw thank you Liz, I’m glad you like the recipe! Stem ginger in this cheesecake really shines through and is soo good! How interesting – ginger stem in syrup! Never heard of this… I will have to use my librarian/teacher search skills to look into this “new ingredient”. I love ginger so I am sure your recipe will open up new info. I always appreciate learning about new ingredients even at my age. This looks gorgeous Jo and I adore the flavours. I bet the spicy ginger is perfect with the creamy cheesecake! I am such a huge fan of cheesecake. In fact, I have been known to make it FOR MYSELF (this is usually connected to a pity party after an especially hard week, almost certainly involving a glass of wine!). My cheesecake is so hard to make, though, so I can’t wait to try your faff-free recipe! Plus, the two layers of ginger flavor (ginger biscuit crust, HELLO?!) are just brilliant! Thanks Michelle! 🙂 Definitely cannot beat the cheesecake when it comes to making one feel better. 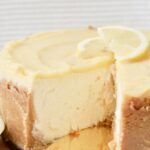 I always thought that baked cheesecakes (which can be a tad labour intensive) are my favourite kind but having tried no bake variety and this one in particular with ginger flavours galore, I think I’m equally fond of both lol! 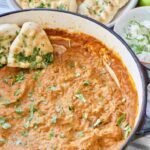 I love anything with ginger and this looks so creamy and delicious! It’s perfect for autumn. Thanks for sharing with #CookOnceEatTwice!